Every time I log on to the world, there’s more evidence that the Tea Party movement’s moment is passing. On this last point, the signs of decline are hard to ignore–and opponents are quick to point them out. At ThinkProgress, Alex Seitz-Wall posts a list of Tea Party demonstrations, this year and last, noting much smaller turnouts and even fewer rallies. Are we getting to the bottom of the tea pot? Demonstrations and rallies are only part of a social movement’s repertoire, but for a movement, the numbers game is unavoidable–and unwinnable over even the medium haul. The frequent, and sometimes relatively large, demonstrations Tea Partiers staged over the 2010 set a baseline of comparison that activists will be hard-pressed to surpass. Organizing large demonstrations takes a lot of time and money, and getting people to turn out requires a sense of urgency and efficacy. It’s not always the appropriate priority for a social movement. Republicans, expressing more and less credible fealty to Tea Party ideals (not always well-defined), made huge electoral gains in 2010, and now are trying to find ways to deliver on their promises. Much of the politics has moved indoors. Meantime, the Tea Party’s rather ill-defined agenda has allowed elected officials to run with it off in different directions. Rep. Paul Ryan’s budget, which included the end of Medicare as an entitlement, is one direction that hasn’t commanded enthusiasm at the grassroots. Senator Rand Paul voted against it. And Senator Paul, who claims, with some credibility to have been a Tea Partier even before the Party started, has been working against the renewal of the Patriot Act and funding America’s current wars–not positions that have generated much enthusiasm from his Republican colleagues in Congress. When you have an institutional ally, taking to the streets seems less urgent, particularly when there are alternative ways to pursue politics, like lobbying and campaigning. Right now, the most important alternative for Tea Partiers seems to be the unfolding campaigns for the Republican Party’s presidential nomination. Most of the hopefuls are trying to find ways to demonstrate their commitments to Tea Party voters within the Republican Party primaries, without hampering their ability to tack to the center during a general election campaign. It’s not pretty. Most people try to find the most direct and least disruptive way to get what they want from politics. 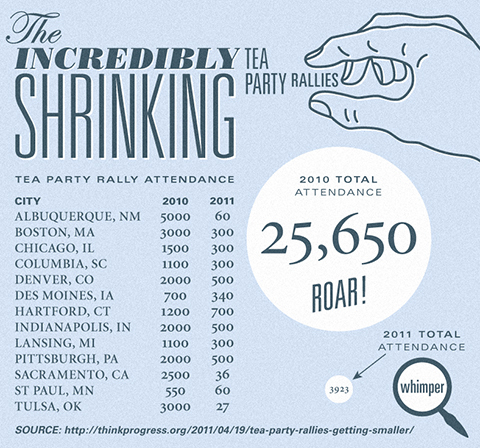 For most of those who supported the Tea Party last year, it’s no longer through large rallies. Organizers know this–or should–and try to find ways to take advantage of what their supporters do want to do. Sometimes, it’s local politics; sometimes it’s national campaigns; sometimes it’s just giving money. We’ll watch to see how much of any of these alternatives is actually happening. When the turnout at the grassroots diminishes, the Tea evaporating, what’s left will be more intense, even bitter. This entry was posted in Uncategorized and tagged demonstrations, numbers, rallies, tea party. Bookmark the permalink.